Integrals are derivatives' half-orange. Together they form the pair of concepts calculus is all about. As with derivatives, integrals generalize a simple intuitive concept that we use everyday: area, volume or mass of something. The first step we need to take is to learn how to make the inverse operation to differentiation, called finding antiderivatives: given a function, find another function whose derivative is that given function. Sounds complicated? It actually is a little more complicated than finding derivatives. We won't be able to find the antiderivative of "any function", something we did accomplish with derivatives. What we'll do really is to learn a bag of tricks that are useful for finding the antiderivatives of some simple functions. Here we won't learn new intuitive ideas. We limit ourselves to learning clever algebraic tricks. These tricks are interesting on their own, and they can actually be fun. After that we'll be ready to introduce the definite integral. The definite integral is the real deal. This concept generalizes the intuitive idea of area, and we'll also see that it can be used to calculate other quantities: volumes, mass, energy, electric charge center of mass and too many other cool things that this page is too narrow to contain. We finally go full circle and return to talk about derivatives and arrive to the fundamental theorem of calculus. This theorem is the real reason we learn to find antiderivatives: it gives us an easy way of calculating definite integrals by finding antiderivatives. In the rest of this page I give an overview of what you need to learn about integrals. In the links I provide you'll learn more in depth about each topic. The concept of antiderivative is really simple. The antiderivative of a given function is another function whose derivative is that given function. This concept is essential because of the fundamental theorem of calculus. We'll discover that a function has infinite antiderivatives. We put them all in the same package and call that the indefinite integral. In the following page we study in detail antiderivatives and indefinite integrals: Indefinite Ingegrals: Introduction and Solved Examples. After we learn the basic definition of indefinite integral, we need to learn some tricks to actually calculate them. These tricks are called techniques of integration. We'll spend a great deal of time learning them. You'll see why they are important only after learning about the fundamental theorem of calculus. This is a place where you need to have a little faith (or go forward and read about the fundamental theorem of calculus). In the following pages we study the techqniues of integration. You should go in the order they are listed, because later ones need previous ones. After you learned all these techniques, you'll be ready to learn about the definite integral. This is where all the hard work finding antiderivatives shows its fruits. 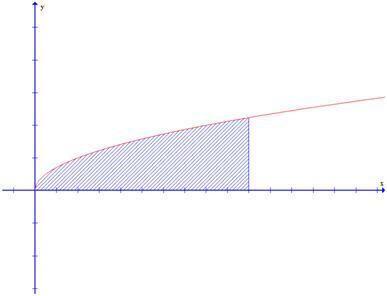 In the following page we introduce the concept of definite integral as the area under the graph of a function (the area shown on the picture below): Definite Integrals: Geometric Intuition. After that we'll be ready to learn about the fundamental theorem of calculus. This theorem relates the derivative and the integral in an unexpected way. In the following page we study the fundamental theorem of calculus: The Fundamental Theorem of Calculus: Geometric Intuition and Solved Problems. Another applications I'm writing about are: calculating areas and volumes of solids, lengths of curves and infinite integrals (improper integrals).